Welcome in the winery Amlinger&Sohn! Our winery Amlinger & son is locacted at the lower part of the Moselle river in Germany, called the "Terrassenmosel" or "terrace-Moselle"; between Trier and Koblenz, at the narrowest and maybe most beautiful Moselle-bow. Our grapes grow in the sunny Moselle-valley, on 600.000.000 year old gray and brown slate. They grow in the "Calmont", Europe's steepest vineyard, and the "Frauenberg" in Neef and around the old cloister-ruin "Stuben". For more than 19 centuries, since the ancient Roman time, the wine has been grown in the climatically favoured Moselle-valley. Here, in the warmest slopes of Germany, prosper wines which unite everything in themselves: Sun and slate, the beauty of the landscape and the care of the winegrower. The vineyards: Slate, 600.000.000 years old, from the Devonian, which stores the heat of the sun. Deep in the soil (old vines up to 12 meters deep) are the roots of our best Riesling and Pinot vines. Tradition - in our winery since 1570: Tradition means craft-like, gentle working in the vineyard, during the harvest, in the cellar. This means careful care of the good, old vineyards. Innovation - this means: to dare to do something new, to make a difference, such as reduced harvests to improve quality even to the extent of lower profits. But innovation also means to give up unnecessary techniques and far too new procedures. We rely on both, tradition and innovation, young and old. The result are our wines: Pleasant, joyful and still honest and typical for the region. Perhaps they just resemble the people that create them a little. From the filigree Riesling to the thick Dornfelder, from the fruity Pinot Noir to the heavy Chardonnay - an inspiring variety, directly from the wine grower. Find your favorites. One wine after the other waits to be discovered by you. Enjoy! We would like to welcome you to one of our already traditional wine tastings. For example, an evening with a suitable culinary delight before the winemaker leads you personally through our selection of fine wines. In our winery Amlinger&Sohn we offer you the advantage to discover a wide variety of different wines - red and white, approx. 35 different sorts of wine. Everyone can find his personally favourite. Furthermore you can get some insight into the process of winemaking during a guided tour through the cellar. You can take a look at our wine cellar “Auf der Heid”, directly located among the wineyards, and also our 2005 established barrique-cellar, where you can experience and taste the process of wine-making. Enjoy the wine, experience the landscape. Stay in our over 120 years-old winery or in one of our eight apartments. Either directly in the winery, close to the Moselle, or surrounded by the vineyards. 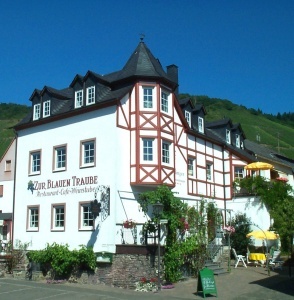 have a delicious meal in the restaurant “Zur Blauen Traube”. Rich breakfast, an interesting wine tasting (for up to 50 persons) of our wide variety of good wines (red and white) - find your personal favourite. Feel the romance of the old winery, the vintner shows you personally, where our wine grows . All houses are located in the sleepy and quite wine grower village of Neef, surrounded by vineyards and the Hunsrück forests. Enjoy our traditional hospitality in our comfortable guest rooms (***) in the winery, every room equiped with shower/WC/TV. This is our parent branch, build more than 120 years ago by our ancestors. Since this time the house is our family-property and is, of course, also used as winery. It is located in the wine-village Neef, directly at the Moselle and only separated from the river only by the village-street. 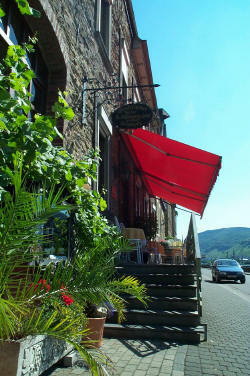 Facing the Moselle and the sun lies our big terrace, where you are heartily welcomed to enjoy a good glass of wine in the evening-sun and to watch life at the river. The approximately 80-100cm thick quarrystone-walls of the old winery are built from the same slate on which also our Riesling vines grow - they were dugged out of the old local quarry in Neef at the "Frauenberg" . And not only because the thick slate keeps the rooms pleasantly cool also in the summer, the wine may even taste better here, where it comes from, than at your home. For breakfast we already in the morning spoil you with home-made jams, the Frühstückbuffett and when desired a Glas ofsparkling wine. Thus you prepare yourselves for a beautiful day with us. Beside our breakfast area a television area and a dte kitchen round our offer off. Already in the morning for breakfast, you can enjoy our homemade jams, the breakfast-buffet and if you like a glass of our own sparkling wine, so that already have a good start into the day. Our offer also includes a television area and a tea kitchen for your use. Arrival times after 18.00 o'clock please indicate at reservation, departure until 11.00 o'clock. New Since 2006: Our wellness area “Auf der Heid” (sauna, solarium, fitness) and five stars for our apartments "Vinum", "Bacchus" and "Calmont" (see below). 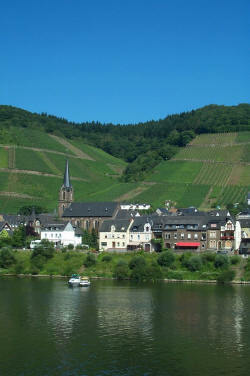 Located directly at the Moselle, where you can experience the beautiful landscape. Watch the calmly passing ships, observe the life at the river and enjoy a good glass of wine in the evening sun. Build in 1996 the apartments Moseluferstraße 11 resemble the old Moselle architecture. For their outstanding furnishings and the beautiful ambience they were rewarded by the DTV with 4 out of 5 stars. The bright ambience and southern flair awaits you - look forward to some beautiful days at the Moselle! Apartment **** 1 - "Brautrock"
Appartment **** 2 - "Rosenberg"
Apartment **** 3 - "Frauenberg"
Apartment **** 4 - "Petersberg"
Renovated and refurnished in 2002 - our comfortable appartment in the winery. Enjoy our wine in the old winery house with its thick and old stone walls and the most beautiful view at the Moselle. Apartment **** 5 - "Kloster Stuben"
From here you have a beautiful view accross the Moselle valley: the calmly driving ships, the sea of golden-yellow vines in October, the azure Mosel, the roofs of the idyllic village glistening in the sunlight and the dark, steep slate rocks. .
Additionally a beautiful garden, a lawn for sunbathing, grill area and, of course, the amazing view on Neef, St. Aldegund, Moselle, Frauenberg and Calmont. Since 2006: Our wellness-area with sauna, solarium and fitness-area. 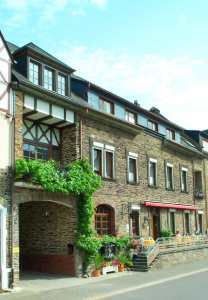 Be on vacation at the Moselle in the midst of the vineyards - first class and newly established.. Apartment ***** 6 - "Vinum"
Of course every apartment has a separate entrance. Sufficient parking lots are directly located in front of the houses. Arrival is possible from approx. 14 o'clock, please indicate arrivals after 18.00 o'clock at reservation, departure until 10.30 o'clock. The valid prices of the respective year of your vacation apply. wine-tasting in the winery: experience our huge variety of wines - from red to white. from Monday to Friday: only 159,- Europer person person in the double-bed room. It awaits you: Untouched nature in the nearby protected area “Taubengrün”, the narrow Moselle-valley between steep slate rocks and gentle river meadows and in the calm Hunsrück forests and any different hiking tracks along side the Moselle or in the hills, for example, the exiting and adventurous hiking and climbing track through Europe's steepest vineyard, the "Calmont". Or refresh yourself during the summer heat in the clear Moselle at the nearby natural beach at the cloister ruin "Kloster Stuben". If you wish you can lend bicycles and make trips by train, ship or car. Our idyllic home town Neef is centrally located. You can most comfortably reach many interesting goals, such as the old cities Cochem, Beilstein, Bernkastel and Trier, the oldest city of Germany with Roman flair. Additional many offers for the whole family await you, such as the Nature - and Funpark Klotten (20km), the Nürburgring, indoor and outdoor swimmingpools with areas for small children, many intersting sports, such as cycling, water sports on the Moselle, paragliding from top of the Calmont (3km), and a golf-course (12km). Special group offers: Day trip to the winery, guided hiking trips, trips in a coveredwagon, winetasting and more. And finally get to know us and our wine during an interesting winetasting, the guided tour through our cellar inspection or a hiking trip through our vineyards. We speak German and English. Hint: You can make free suggestions, e.g. "10 days in August"
Half-board in the &ID=blauetraube">Landgasthof "Zur Blauen Traube"
Additional wishes: e.g. “Rooms with view of the Moselle”, “as a voucher for somebody"
Please call us by phone for short-term inquiries (e.g. for the next weekend), Tel. (+49)) (0) 65 42 - 29 62.